And the award for the food that looks like food you would be rationed whilst living outside of the Matrix or conceived of being by a focus group of little kids goes to….White Cheddar Cheetos (Frito Lay). Not pretty to look at but awful delicious. 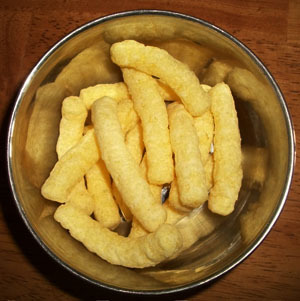 I don’t know why but I had the biggest craving for cheese puffs. This bag won out over regular cheese puffs because frankly the word “Simply Natural” was written very large. That really shouldn’t need to be a headline. It begs you to wonder, what’s in the other bags? Regardless I got the bag anyways. What’s amazing is that no matter how many you eat you don’t feel full. Your fingers though get that tell-tale coating of guilt. Ingredients: Cormeal, cheese, milk. (And mostly other familiar stuff). Where do you buy Simply Natural White Cheddar Puffs? Someone had them at a party and they were delicious. But when I go to the store I never see them ANYWHERE. Help. It’s hard to get both tasty and healthy at the same time but I agree White Cheddar Puffs are delicious! I really wish I hadn’t clicked on this post. I’ve got a Cheeto addiction that won’t quit! Hahha that’s true but very tasty. Thank you as well. Keep it up! Thanks for adding me to your blogroll. I apologize for the late response. Hope India is treating you well or at least keeping it interesting. Cheers! Are the Simply Natural Cheetos Puffs deep fried? Or are the oven-baked? Hi Katt- According to a few websites they’re baked. Thanks for the question.